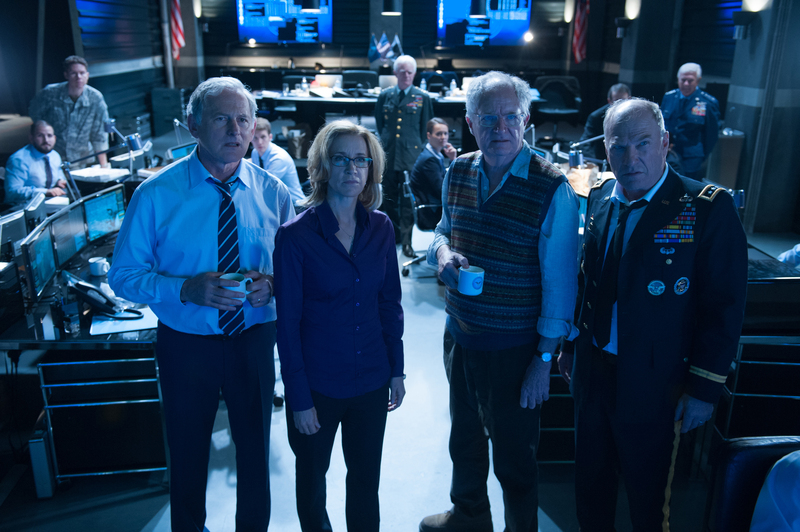 (L-R): Victor Garber as The Vice-President, Felicity Huffman as The CIA Director, Jim Broadbent as Herbert and Ted Levine as General Underwood in the action film “BIG GAME.” ©EuropaCorp. The Canadian thespian acknowledges by phone from the Big Apple that he is excited about joining the new series, but as of now there is little he can reveal about it because he hasn’t even seen a script yet. In the meantime, fans can see Garber in two upcoming feature films: “Big Game,” an action-packed espionage thriller set in Finland and the sci-fi psychological thriller “Self/less,” directed by Tarsem Singh (“The Fall, “Immortals”). In “Big Game,” filmed by Finnish director Jalmari Helander, the three-time Emmy nominee plays the Vice President of the United States, who is called into action at the Pentagon when the President’s plane is shot down over Finland’s mountainous wilderness. 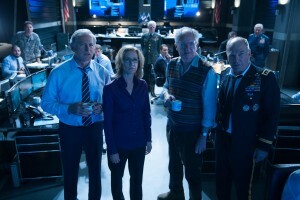 He, along with the director of the CIA (played by Felicity Huffman, “Desperate Housewives”) seek the guidance of a unorthodox former CIA operative and advisor (Jim Broadbent) in how to rescue the Commander-in-Chief before the unknown perpetrators of the plot can capture him. The President (played by the ubiquitous Samuel L. Jackson) is aided by an unlikely hero—a 13-year-old local boy (newcomer Onni Tommila) on his first solo hunting expedition. Armed only with a bow and arrow, the boy attempts to guide the leader of the free world to safety. Will Garber’s Vice President have to be sworn in or will the Navy SEALs arrive in time to save the President from the terrorists? In “Self/less,” Garber plays the longtime business associate of a wealthy industrialist (played Ben Kingsley), who is dying of cancer. Moral questions arise when the dying businessman undergoes a radical medical procedure, which restores his consciousness into a healthy body. In both films, Garber’s characters are multilayered and harbor secrets that emerge as the plots move forward. He spoke about tackling those roles and what’s ahead. Q: With “Big Game,” where did you, Felicity Huffman and Jim Broadbent shoot your part of the film? Garber: We were actually shooting in Munich. A lot of the film was shot in Germany. All of our stuff was shot in a studio in Munich. The nice thing about it is that it was contained over the period of a week or so. I can’t remember exactly how long it was but it wasn’t that long. That’s what attracted me to the movie, as much was that it was going to be contained and that I would be able to be in the room with those actors. Felicity I knew socially but we had never acted together. Jim I didn’t know but I was a huge fan of his so that was a huge attraction for me. Q: Did you have time to socialize at the end of the day? Garber: There was always time for dinner. That’s all Felicity and I did. It was like, “Where are we eating tonight? Let’s try this.” And her brother was visiting so we’d all go out along with Jim and his wife. So, for me, especially when you’re on location, there’s nothing sadder than to be on your own and you have to go find a restaurant and eat dinner. So we hung out a lot after a day of work. It was much fun. Q: Were you familiar with director Jalmari Helander’s work? Garber: No, I hadn’t. I basically just went on blind faith. And it turned out to be a really good experience. That’s always nice when that happens. Garber: (he chuckles) I’ve played the devil (in the Broadway revival of “Damn Yankees”). I’ve played Jesus (on stage and in the film version of “Godspell”). Q: Without giving away the plot, there is more to your character than we initially see. Garber: Yeah, and frankly, that’s what was interesting to me. That’s one of the reasons I wanted to do it. It’s a small little part but it has a lot of odd little twists in it, and I thought it would be fun to see if I could pull it off. I knew I was surrounded by really gifted actors so I figured we had a really good shot at it. Q: Did you visit Finland while you were filming in Europe? Garber: Unfortunately, no. I know that a lot of the exteriors were shot in Germany, although it’s supposed to be Finland. Even when I finally saw the movie, I thought those shots are really amazing. That topography is just stunning. I thought he did a great job. It’s rare that you actually get to go to the place where a film is set. Q: You have some very quotable lines in this. Did you get a chance to play with the dialogue? Garber: I can’t remember, really, because it was a while back when we shot it. But I know there was a certain amount of freedom because with Jalmari, English is not his first language so he trusted us to find out way through it. We stuck with what obviously had to be done but we were able to augment here and there with expressions and so on. That’s also part of the fun of doing a movie like this, especially with actors like the ones I was working with. There’s a sense of freedom about it. Q: Since you were born and raised in Canada, did you ever go hunting or know any big game hunters? Garber: (He laughs.) No. I’m about as urban as they come. I wouldn’t even go in the backyard. We had a little dog and that was about it. My brother was much more adventurous than I was. We have a house upstate (New York), and I’m just terrified that I’m going to run into a bear one day. Q: You began acting at age 10, right? Garber: Yes, I was about that. My playground was the theater when I was a kid and it remains that to some degree today. Q: In “Self/less” you also play another character with a secret. How was it working with Tarsem Singh and Sir Ben Kingsley? Garber: I really liked the script and was really happy to get a role that actually had more than two scenes in it. I had worked with Sir Ben on a film called “Tuck Everlasting” many years ago, along with Amy Irving. 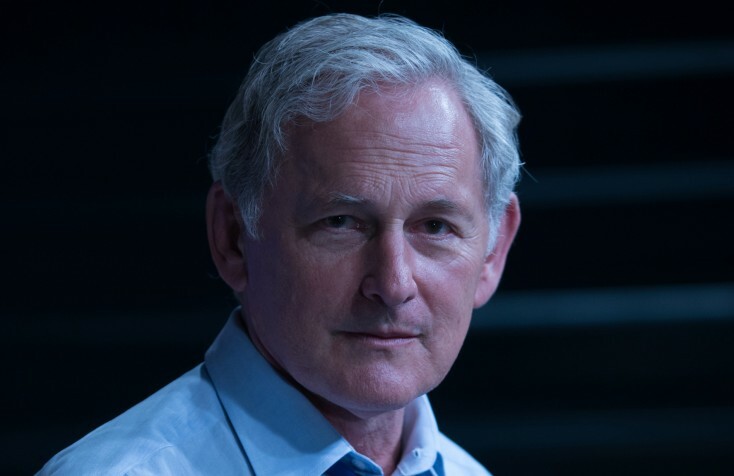 He was great to work with so I was looking forward to working with him again (in “Self/less”). We had a very good time and it was very comfortable on the set. Tarsem was wonderful. He was very funny and he had a great kind of whimsical approach to things but he also was very specific. So it was a great experience, and Ryan (Reynolds, who plays the lead) was much too nice. He’s the sweetest guy. The twists and turns of that movie are pretty intriguing and I hope that people go for that ride. It’s really a fun movie. Q: Can you say anything about the spinoff at this point? Garber: All I can tell you is the promo video that is out is as much as I know because I haven’t read a script or shot a scene yet from the new series. We’re going to Comic-Con in July so I’m assuming (show creator) Greg Berlanti will be able to talk about it (then) because we don’t know anything, other than I’m playing the same character that I play now, and we’re in this sort of odd grouping where we’re going to be fighting crime. So I’m looking forward to it but I don’t know what it’s going to be. Q: You’re in the upcoming cartel thriller “Sicario” as well. Garber: I am. I seem to be everywhere. I did a lot of these movies a long time ago and now everything seems to be coming out at the same time. That’s a really interesting film and I have a small part in it. Denis Villeneuve, the director, is a really great, great guy. We shot it in Albuquerque last summer. I loved working with (co-star) Emily Blunt; she’s the greatest. I haven’t seen the movie yet but I know it’s really dark. But people seem to like it so I’m looking forward to seeing it. Q: Is there any possibility of an “Alias” reunion? Is there more Jack Bristow in your future? Garber: No. I wish. I just had dinner with (co-star) Michael Vartan. I just saw him and I see Jennifer (Garner), obviously, and J.J. (Abrams). But no, we have no plans to reunite. I think it would be too odd now for all of us to be back together but it would be nice. Garber I go back to do “The Flash” in July.